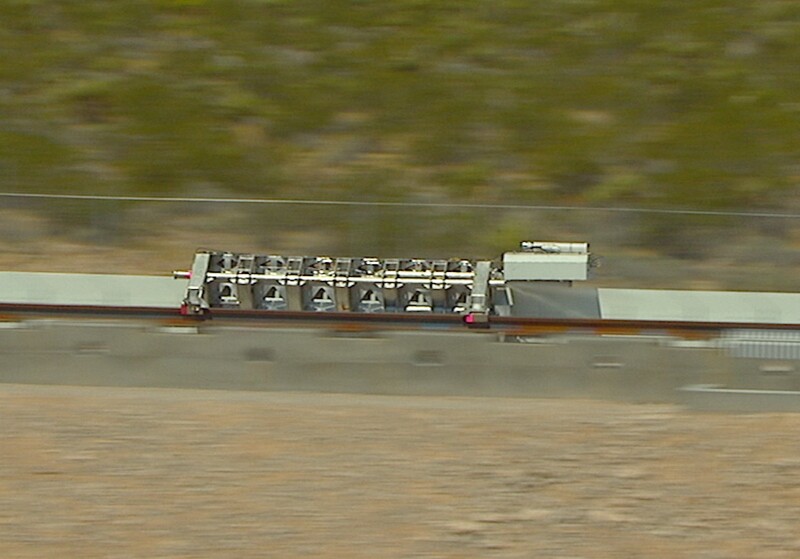 The newly renamed Hyperloop One venture sent an electrically propelled sled down a Nevada test track at speeds that went beyond 100 mph in just two seconds, marking the public debut of its rapid-transit propulsion system. Hundreds of journalists and VIPs watched the open-air propulsion test, which represents a milestone in the effort to commercialize a high-speed transportation system conceived three years ago by Elon Musk, the billionaire CEO of SpaceX and Tesla Motors. Theoretically, such a system could transport passengers in levitating pods through elevated tubes at near-supersonic speeds, bridging the distance between, say, San Francisco and Los Angeles in a half-hour. But turning theory into fact will probably require spending billions of dollars, pioneering scores of technologies and negotiating unprecedented regulatory hurdles. Today’s test was meant to demonstrate first-generation Hyperloop technology, and show that Hyperloop One was serious about building hardware and laying track, albeit for scaled-down testing. Hyperloop One already has raised more than $100 million for its venture, including$80 million in investments that were announced on May 10. This entry was posted in GeekWire and tagged Hyperloop, Hyperloop One, Technology, Transportation. Bookmark the permalink.